What was happening in the silk floral stems market, and the artificial flower industry in general? Manufacturers began offering enhanced high quality floral stems and related products, a much expanded selection of colors and categories — but would they be readily available to silk flower arranging enthusiasts? The CEO of Aldik Artificial Flowers shared his insights in this 2005 interview. A blunt conversation with Aldik's Larry Gold. CLN: How would you describe the recent history and current state of the silk flower market? GOLD: I think the silk flower market is in good shape at the upper end. Good design, good quality and trend-forward looks are selling very well. Because of the increase in sales of pre-made arrangements the last couple of years, I think the industry has taken their eye off the floral stems market. But Aldik has concentrated on the stem florals as well as the pre-made product, and we have seen big increases in sales of both types of product. CLN: So your recent product introductions reflect your thinking? GOLD: We introduced Chelsea Cuttings in the summer, mainly roses and peonies and gardenias (long and short stems) that look like they are cut from the garden and can be put into water to give a truly realistic look. In addition, we introduced Chelsea Cuttings Fragrances that can be put on the flowers to give a truly realistic fragrance to the flower. They can either be put on the flower head or into the water, and they truly complete the illusion from silk to real. Very realistic fragrances that are not overpowering. We introduced a new Citrus Garden line of floral stems and containers that were incredibly successful. They were in the Lemon, Lime and Tangerine colors that are very popular now. This has been one of our best introductions. At the recent winter shows, we introduced a new palette of colors, Sonoma Gardens, that takes the citrus colors to a more sophisticated and classy level. Lemon becomes gold, lime becomes avocado, and tangerine becomes paprika. The response has been great, and we expect this line to be a big success. In addition, we introduced a line of floral stems and containers in brown tones that match almost any color. Most brown tones have either green, yellow or gray in them, and it precludes them from blending with the other colors. Our Warm Neutral line is a neutral brown line that goes with greens, blues, whites, and yellows, and virtually any other color. It is a classy, upscale neutral brown line that goes with almost any decor. CLN: Are you seeing craft stores shrinking the size of their floral departments in order to make room for categories such as yarn and scrapbooking that are currently growing? If so, doesn't that almost guarantee floral sales will decrease because the consumer has less to choose from? GOLD: Yes. While some of the consolidation of the departments was warranted, I think for the craft stores to succeed in the silk floral business, their offering needs to be fairly broad. They need to offer various price points, and some medium to high quality floral stems in addition to the basic color lines. In addition, a new color or trend theme needs enough components shown to make a statement. The shrinking floral departments are being done at the expense of the better quality floral stems, and this is making the floral offering much less interesting and more lower-end. CLN: Retailers seem to be constantly trying to lower prices — and pressure vendors to do the same. Is there a danger that the ultimate result will be poorer quality florals that the consumer rejects? GOLD: That is already happening. As the price-point and ultimately the quality in the department decreases, the sales decrease. The department may sell more units, but that just increases their transaction costs, and the sales figures are less. Consequently the profit in the department decreases and there is further pressure to decrease the size of the department. CLN: Some retailers try importing, thinking that by cutting out the middleman, they'll improve their margins. But doesn't this just create new types of problems for them? GOLD: It increases their margin. It also puts all of the inventory risk on them. If they don't buy enough, they will lose sales and profit. If they overbuy, they will have to dispose of excess inventory and they will lose profit. If they put the inventory burden on the importers and buy domestically, they will lose some margin, but completely eliminate the inventory risk, and ultimately net a higher profit. Also, if they deal directly with the factory, they lose the design ability that the importers provide. The importers are the designers and innovators in this industry, and by dealing direct with the factories, the retailers lose this. CLN: Maybe years ago when the quality of imported florals was poor, crafters used to make and arrange florals. Then as the quality improved, consumers just arranged the florals. Is there a trend now that consumers are buying silk flower arrangements? GOLD: Consumers are buying silk flower arrangements, because the quality is so much better than before. But, in addition, the trend is that when consumers do their own arrangement, they are not necessarily 'arranging' it. They are buying several stems of a high quality flower and placing it in a vase, the same as they would do with real flowers. They can even put water in the vase, and the 'arrangement' will appear to be real. This only works with high quality stems, and I think the craft stores are missing the boat because they are buying less of these quality stem florals than ever before. CLN: Where should the floral industry go from here? What do retailers, vendors, and trade associations need to do to improve sales? GOLD: I think the floral industry is going in the right direction. I think the demand for quality is increasing, and the price points are rising. The craft industry is running counter to this trend, and I think that is hurting their floral sales. Aldik has spent a lot of effort increasing the quality and design of our silk floral stems, and as a result our increases in floral sales at the recent trade shows were up by over 28%. 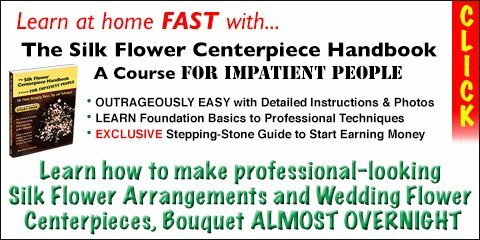 Thanks to Mike Hartnett, Publisher of Creative Leisure News, for granting reprint permission of this interview about this trend in silk floral stems. Be sure to explore the entire site for interesting hobby industry news and craft-related articles from his newsletter. Looks like Aldik and Larry Gold were on target as to what consumers wanted — and still want — to see in silk floral stems: more realism, a broader range of colors, and truer floral scents. You were right, Larry. Applause, everyone! I only hope that you and I can find these high-end artificial floral stems at our favorite craft stores or silk flower shops. I want the good quality stuff, and I don't mind paying a bit more for silk floral stems that make people look twice at my silk flower arrangements — and have them coming back for more.